Blocking a crosswalk with your vehicle can earn you fines, as well as dirty looks from pedestrians. If you’ve driven in a busy city, you’ve probably found yourself blocking a crosswalk at least once. But there’s a difference between miscalculating whether you’ll be able to get through an intersection on the green – or not seeing that the intersection was blocked because there was moving truck in front of you – and just trying to barge your way through. Failing to yield to a pedestrian could net you a $167 fine. Stopping in a crosswalk is another $40 fine, Doucette said. You should be approaching an intersection slowly enough that you should be able to stop in time, Doucette said. And you should normally be stopping well in advance of the crosswalk. We asked how many people get charged for this, but the numbers weren’t available. The rules vary by province – and sometimes by municipality – but they’re similar. In Montreal, it’s included in a provincial law banning parking on sidewalks and medians, and comes with a $100 fine. If you get to an intersection and traffic is snarled on the other side, wait. 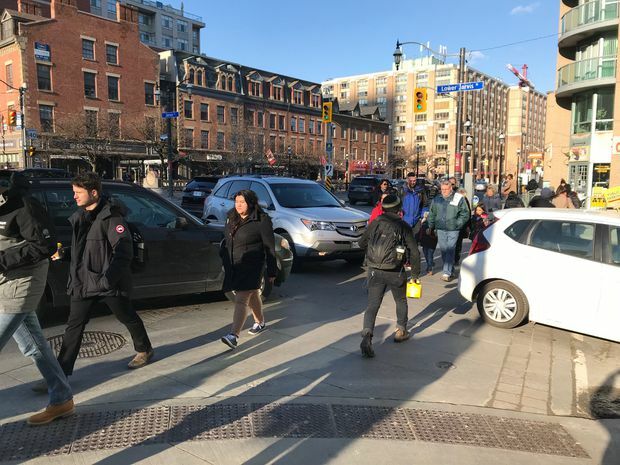 And if traffic is snarled and you’re stuck at a light for two or three cycles, it can be tempting to try to get through – even if there’s not quite enough room on the other side to clear the crosswalk. If you’re stuck at a light, you can try to get out of the intersection by making a right turn. But, if pedestrians are trying to beat the countdown and crossing when they have three seconds left on the timer, it can be tough to turn. And if you get stuck making a turn because you had to wait for a few daredevils, you might end up blocking the crosswalk. Nobody is working in the construction zone. Am I still obligated to slow down?